* October 24, 1960 in Oberhausen, Germany; † August 21, 2010 in Berlin. Director for film, theater, opera, Author of radio plays, Performance artist and Talkmaster. 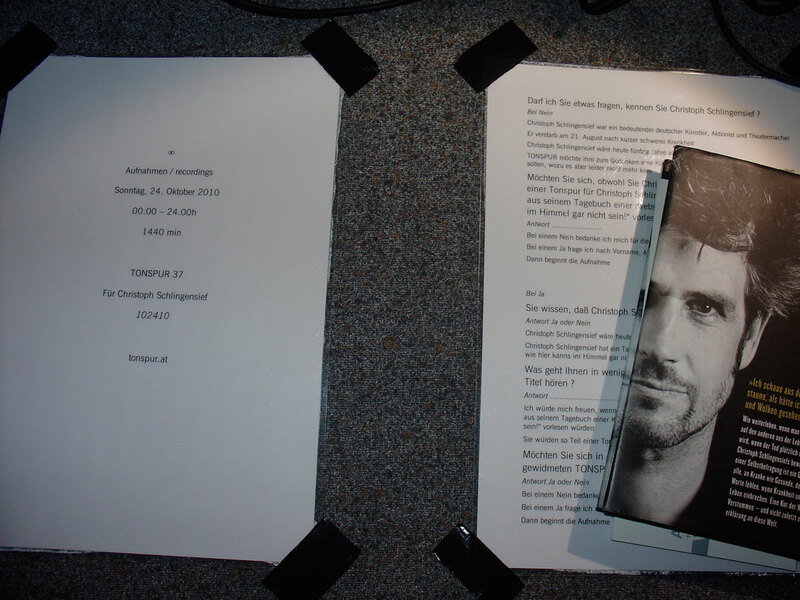 “Oh, hello, so it’s you with the sound on the Schlossplatz” – with these words Christoph Schlingensief greeted me on June 14th, 2010 in the Arsenal of the Vienna Burg Theater after the second performance of his “Via Intolleranza II”. 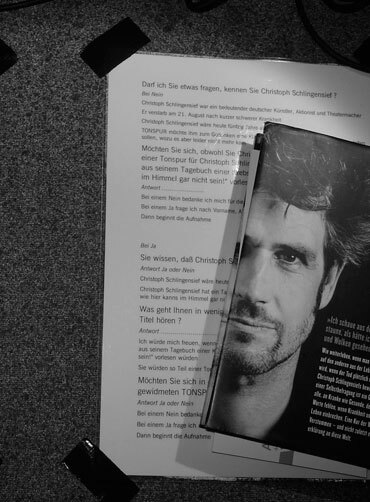 Preceding this first and last meeting were more than a year of efforts to interest this extremely busy and omnipresent artist, “an important voice”, in our “TONSPUR für einen öffentlichen raum” series. Our hope was that we might elicit a sound work from him which we could realize on the Schloßplatz in Berlin, the adopted home of the artist. Unfortunately, it never came to this. sssssssssssssssssJust a few weeks after our meeting, Christoph Schlingensief succumbed to cancer. I had proposed broadcasting his amazing “Opera Village Africa” in Burkina Faso as a sound-landscape on the Schloßplatz. I had been inspired by Schlingensief’s own proposal to construct a village of African huts in front of the future Humboldt Forum as a form of public art. I would have loved to have worked with this incredibly intelligent, imaginative, and untiring artist. 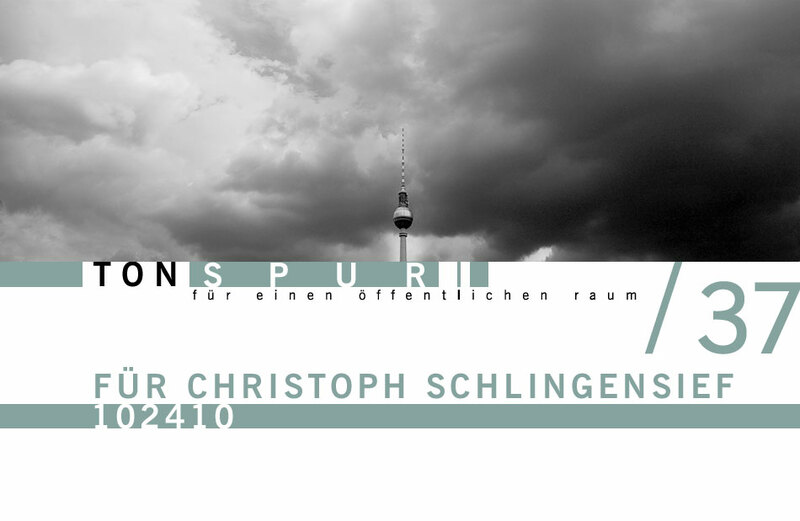 TONSPUR 37, which will run for several weeks precisely up to the new year, is dedicated to Christoph Schlingensief. The idea was to take the title of his cancer diary allegorically (“Heaven could never be as beautiful as it is here!”) and to acoustically observe his birthday. On October 24th, 2010 he would have been 50 years old, and throughout that day I recorded the wind and weather, the sound of the waking Berlin Mitte, the noises and conversations of passers-by on the Schloßplatz, the crows who appear in the mornings by the thousands and greet and close the day with their spectacles of sound and flight, the noises of the coming night. I also stopped and invited passers-by to read aloud pages from Schlingensief’s much discussed diary, to lend him their voices.